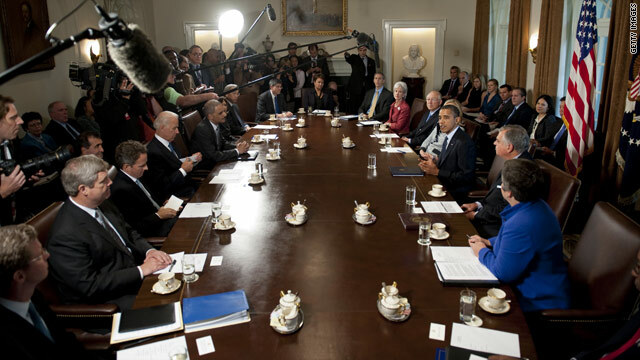 Did you know…where the table in the Cabinet Room comes from? The president is giving several interviews with local news reporters in the Cabinet Room Tuesday. Did you know the Cabinet Room table is made of mahogany and was a gift from President Nixon in 1970? It seats 20 and the president occupies a taller chair than everybody else at the table. and who did Nixon steal the money from to buy the table? Typical Lib. You get something for free and it still isn't enough. Actually you are wrong! There have been countless studies regarding intellect between libruls (as you would call it) and conservatives. Below is an excerpt. Sorry about that, but most people attending college lean liberal. Must really bother you – HUH? But are liberals actually smarter? A libertarian (and, as such, nonpartisan) researcher, Satoshi Kanazawa of the London School of Economics and Political Science, has just written a paper that is set to be published in March by the journal Social Psychology Quarterly. The paper investigates not only whether conservatives are dumber than liberals but also why that might be so. The short answer: Kanazawa's paper shows that more-intelligent people are more likely to say they are liberal. Boy call a spade a spade. He doesn't even read the article where the table was a gift. isn't it surprising to not see Obama's feet crossed upon the table. He has no respect for America or it's antiques. After this administration is done, the table should be burned. Please read my post earlier to John. The two of you make the phrase "ignorance is bliss" a fact. One thing is for certain is that Liberaals are more homosexual, Atheist, and immoral idiots. I'm sure we paid entirely too much money for it, despite the claim it was a "gift". Thanks Trace! It does stand to reason that libs are smarter than cons. That was certainly proven during the years of 2001-2009. Oh wait..they're going to jump out and scream the DEMS were in the majority in the Congress! Oooooh...well that further shows us that we are more intelligent, more loyal to the so called 'greater good', more honorable and respectful to the President and his administrational choices; patriotic enough not to lodge panic, controversy and discourse throughout the nation and the world! Call him what you really want to call him FIELD1stSGT! We know what a 'spade' is JERK! Your just another attack dog, nothing real is said. You are a fake, no real !st Sgt would attack any president in such a disrespectful manner, the rank itself shows a dedication and respect for this country and its leaders. he may disagree and argue the facts, but never show such disrespect as you have. You are another fake, stealing honer from those who have and are serving. Learn to disagree while showing respect for yourself and others, thats what the Army taught me and my son.